Hazmat storage containers by US Chemical Storage create a safe storage atmosphere for hazardous materials. When storing hazmat, it is necessary to identify potential risks associated with each chemical being stored. Hazardous materials must be carefully labeled, identified, handled and stored. Chemicals shall also include material safety data sheets (MSDS), for personnel, officials or other individuals who might come in contact with the hazardous material. Potential hazards associated with chemicals include fires, explosions, low oxygen levels, reactivity, release of dangerous gases, and chemical spills and leaks. These are some of the general hazards that are associated with chemicals if they are not handled or stored properly. Overexposure from hazardous chemicals can result in a range of hazards from headaches to skin damage, organ damage and in some cases even death. It is very important that dangerous chemicals are stored in a safe environment to avoid any hazardous situations. 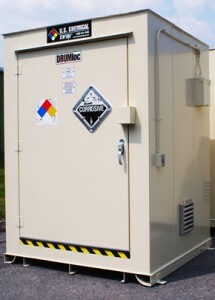 Hazmat storage buildings offer a safe atmosphere for keeping your inventory stable and 100% compliant. US Chemical Storage manufactures the strongest and most trusted hazmat storage buildings on the market today. We understand the hazards that are associated with different chemical classes, and we are dedicated to safety, security and compliance. Customize your hazmat storage building with a full range of explosion proof and non-explosion proof accessories. Our hazmat storage buildings can be customized with explosion relief panels, mechanical ventilation systems, cooling systems, temperature controls, heating systems, lighting, flooring options and more. Compliantly store your hazardous material drums, totes, pallets, pails or small containers with a hazmat storage building by US Chemical Storage. Meets EPA, OSHA, NFPA and FM or Warnock Hersey approvals. Non-fire rated or fire rated constructions available. Store your hazmat nearby or inside your facility. Available climate control from -20°F to over 175°F. Chemical, weather and UV radiation resistant. Get compliant with a hazmat storage container for full compliant today.